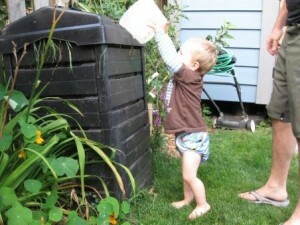 Composting is an excellent way to reduce the amount of waste that goes to the landfill. 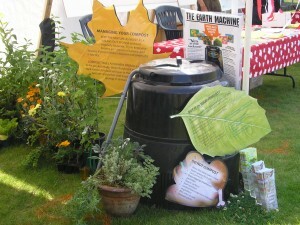 How does composting help my garden grow? It helps hold moisture in the soil making your plants more drought-tolerant. Compost releases nutrients slowly when your plant needs them. magnesium and boron) to the soil. resistant to disease and pest problems. about 3″ deep. Too much green material will result in an overly wet compost pile (which will become anaerobic and begin to smell strongly). If you add a lot of grass, you also need to add a lot of brown material to balance the recipe. The goal is one-half brown to one-half green! the balance of green, wet materials and brown, dry materials. Material size – Chop up the materials in 3″ pieces. The smaller, the better. Carbon to Nitrogen ratio – Add equal amounts of brown, dry material with green, wet material. Moisture – The compost pile works best when as wet as a wrung out sponge. bin to heat up again. Mix once a week. The finished product is dark brown, crumbles and smells earthy! Save your fall leaves for summer composting. Bury food in the bin to avoid fruit flies. 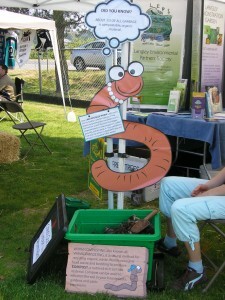 Add a scoop of soil every once in a while to introduce fungi and other organisms to the bin. Harvest in spring-time when your plants are growing.